We found some unique wedding save the dates and invitations…they are wooden. They are so beautifully made and are a great out of the box idea to use instead of paper invitations. They engrave everything, and can even add color to you invitation! 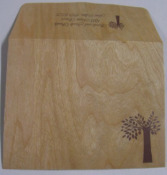 They offer wooden envelopes, and thank you cards. You would be surprised how affordable this paper alternative is. Also they have other items like key chains, book marks, and ornaments. If you are interested in learning more or ordering this product just contact Special Moments at [email protected] we would be glad to help you!